No specific causes for posterior fossa tumors exist. However, genetic factors, such as dysfunction of some tumor suppressor genes (p53 gene) and activation of some oncogenes, may play a role in their development. Environmental factors such as irradiation and toxins may also play a role. Advances in brain surgery for tumors primarily were due to discovery of anesthesia, asepsis, neurologic localization, and the ability to achieve hemostasis. Hippocrates, who likely performed it for headache, epilepsy, fractures, and blindness, first described trephination. 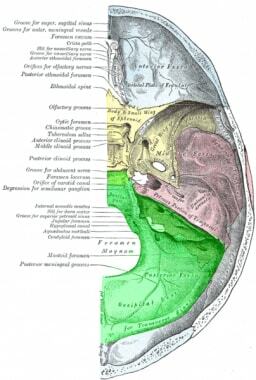 An image depicting posterior fossa anatomy can be seen below. Posterior fossa tumors are more common in children than in adults. Central nervous system tumors are the most common solid tumors in children; between 54% and 70% of all childhood brain tumors originate in the posterior fossa. About 15-20% of brain tumors in adults occur in the posterior fossa. Certain types of posterior fossa tumors, such as medulloblastoma, pineoblastoma, ependymomas, primitive neuroectodermal tumors (PNETs), and astrocytomas of the cerebellum and brain stem, occur more frequently in children.Some glial tumors, such as mixed gliomas, are unique to children; they are located more frequently in the cerebellum (67%) and are usually benign. CT scan of the posterior fossa is inferior to MRI in diagnostic value because of the artifact produced from the surrounding thick bone. However, CT scan is helpful for postoperative follow-up. Cerebral angiography is useful to assess the vascular supply of the tumor, but with the wide availability of MRI, cerebral angiography is no longer used as the first option in brain tumor assessment. A 28-year-old female patient presented with headache, ataxia, and blurring of vision. A T1-weighted MRI image, sagittal view, shows dilatation of the lateral ventricles. A 28-year-old female patient presented with headache, ataxia, and blurring of vision. A T1-weighted MRI image, sagittal view, shows an infratentorial mass with a large cystic component and small nodule. The mass is compressing the brainstem. 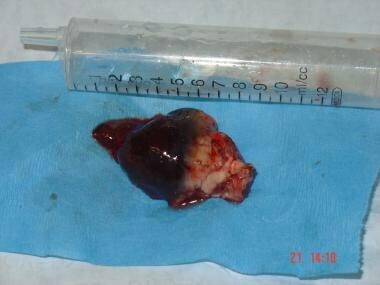 The tumor (the infratentorial mass) after excision shows its vascular nature (see previous images). Performing a lumbar puncture in patients with suspected posterior fossa tumors is contraindicated. A risk of central herniation exists even with a very small amount of CSF drainage. To avoid this catastrophe, a thorough clinical examination, including funduscopy and a CT scan of the brain should be performed before lumbar puncture. Cystic cerebellar astrocytoma comprises about 33% of all posterior fossa tumors in children. It represents 25% of all pediatric tumors. Average age at presentation is 9 years. Typically, cerebellar astrocytoma presents as a laterally located cyst with a well-defined solid component. The tumor may be solid or cystic and may be located medially in the vermis or laterally in the cerebellar hemisphere. PNETs include medulloblastomas, medulloepitheliomas, pigmented medulloblastomas, ependymoblastomas, pineoblastomas, and cerebral neuroblastomas. These tumors originate from undifferentiated cells in the subependymal region in the fetal brain. PNETs are second to the cerebellar astrocytoma in frequency, comprising 25% of intracranial tumors in children. Ependymomas are derived from ependymal cells. They occur more frequently in females, with 50% presenting in children younger than 3 years. An ependymoma has a much better prognosis than an anaplastic ependymoma (ependymoblastoma). Plastic ependymoma can mold itself to the available spaces inside or outside the ventricle without adhering to the ventricle. 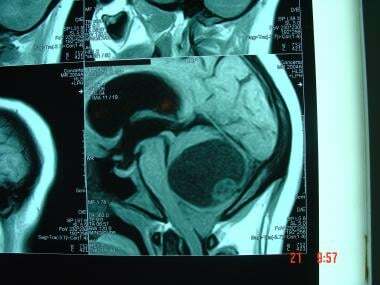 Choroid plexus papilloma and carcinoma represent 0.4-0.6% of all intracranial tumors. They are more frequent in children than in adults (3% of childhood brain tumors). Sixty percent occur in the lateral ventricle and 30% in the fourth ventricle. The third ventricle and cerebellopontine angle are rare locations for this tumor. Cerebrospinal fluid (CSF) overproduction may occur, sometimes reaching more than 4 times normal volumes. In most of cases, CSF analysis demonstrates increased protein, xanthochromia, or both. Dermoid tumors arise from incomplete separation of epithelial ectoderm from neuroectoderm at the region of the anterior neuropore; this usually occurs during the fourth week of gestation. The cyst wall often includes hair follicles, sweat glands, and sebaceous glands. The cyst grows slowly and gradually becomes filled by desquamated epithelium, sweat, and sebaceous materials. Aseptic meningitis is a sequela of cyst rupture. More commonly, the cyst occurs in the posterior fossa, at or near the midline. It may be extradural, vermian, or intraventricular. A dermal sinus may be connected to the mass. It may be detected clinically or by MRI. Three percent of all cranial metastatic lesions occur in the brainstem, and 18% occur in the cerebellum. Originating sites include breast, lung, skin, and kidney. Solitary metastasis is better treated by surgical removal before radiation therapy. Surgery also should be considered in case of radiosensitive original tumors or when the primary source is unknown. Brainstem gliomas constitute 15% of all brain tumors. In children, brainstem glioma represents 25-30% of all brain tumors. Most brainstem gliomas are low-grade astrocytoma. The posterior cranial fossa is the deepest and most capacious of the 3 cranial fossae. It contains the cerebellum, pons, and medulla oblongata. The foramen magnum is located centrally and inferiorly in the posterior fossa. The posterior fossa is surrounded by deep grooves containing the transverse sinuses and sigmoid sinuses. The brainstem is the portion of the brain connecting the cerebral hemispheres with the spinal cord. It contains the midbrain, pons, and medulla oblongata. The brainstem is partially obscured by the cerebral hemispheres and cerebellum. The gray matter in the brainstem is scattered into numerous small masses called nuclei, many of which are motor or sensory nuclei of the cranial nerves. The midbrain is the portion of the brain that connects the pons and the cerebral hemispheres. The dorsal segment of the midbrain is called the tectum; the more central and ventral portion is called the tegmentum. The pons lies anterior to the cerebellum and superior to the medulla, from which it is separated by a groove through which the abducens, facial, and acoustic nerves emerge. The medulla oblongata is the pyramid-shaped segment of brainstem between the spinal cord and pons. The lower half contains the remnants of the central canal; the posterior portion of the superior half forms the floor of the body of the fourth ventricle. The cerebellum is located in the posterior fossa of the skull, dorsal to the pons and medulla. It is separated from the overlying cerebrum by an extension of dura mater, the tentorium cerebelli. It is oval in form, with its widest diameter along the transverse axis. It is composed of a small, unpaired central portion (the vermis) and 2 large lateral masses (the cerebellar hemispheres). Prognosis in medulloblastoma is worse for children younger than 2 years, for patients with subtotal resection (80%), and for those with subarachnoid metastasis or positive results on CSF cytology more than 2 weeks after surgery. In patients with ependymomas, the 5-year survival rate is 20%; in ependymoblastoma, the 5-year survival rate is only 6%. Choroid plexus papilloma has excellent prognosis, as high as 100% survival rate. Choroid plexus carcinoma has a poor prognosis. Badhe PB, Chauhan PP, Mehta NK. Brainstem gliomas--a clinicopathological study of 45 cases with p53 immunohistochemistry. Indian J Cancer. 2004 Oct-Dec. 41(4):170-4. [Medline]. Zhou LF, Du G, Mao Y, Zhang R. Diagnosis and surgical treatment of brainstem hemangioblastomas. Surg Neurol. 2005 Apr. 63(4):307-15; discussion 315-6. [Medline]. Wilne S, Collier J, Kennedy C, Koller K, Grundy R, Walker D. Presentation of childhood CNS tumours: a systematic review and meta-analysis. Lancet Oncol. 2007 Aug. 8(8):685-95. [Medline]. Zabek M. Primary posterior fossa tumours in adult patients. Folia Neuropathol. 2003. 41(4):231-6. [Medline]. Cushing H. Experience with the cerebellar medulloblastoma: critical review. Acta Pathol Microbiol Immunol Scand. 1930. 7:1-86. Johnson KJ, Cullen J, Barnholtz-Sloan JS, Ostrom QT, Langer CE, Turner MC, et al. 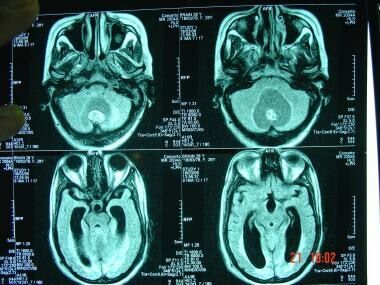 Childhood brain tumor epidemiology: a brain tumor epidemiology consortium review. Cancer Epidemiol Biomarkers Prev. 2014 Dec. 23 (12):2716-36. [Medline]. Lin CT, Riva-Cambrin JK. Management of posterior fossa tumors and hydrocephalus in children: a review. Childs Nerv Syst. 2015 Oct. 31 (10):1781-9. [Medline]. Lam S, Reddy GD, Lin Y, Jea A. Management of hydrocephalus in children with posterior fossa tumors. Surg Neurol Int. 2015. 6 (Suppl 11):S346-8. [Medline]. Le Fournier L, Delion M, Esvan M, De Carli E, Chappé C, Mercier P, et al. Management of hydrocephalus in pediatric metastatic tumors of the posterior fossa at presentation. Childs Nerv Syst. 2017 May 11. [Medline]. Schijman E, Peter JC, Rekate HL, et al. Management of hydrocephalus in posterior fossa tumors: how, what, when?. Childs Nerv Syst. 2004 Mar. 20(3):192-4. [Medline]. Millard NE, De Braganca KC. Medulloblastoma. J Child Neurol. 2015 Sep 2. [Medline]. Horisawa S, Nakano H, Kawamata T, Taira T. Novel Use of the Leksell Gamma Frame for Stereotactic Biopsy of Posterior Fossa Lesions: Technical Note. World Neurosurg. 2017 Jul 21. [Medline]. Hamisch C, Kickingereder P, Fischer M, Simon T, Ruge MI. Update on the diagnostic value and safety of stereotactic biopsy for pediatric brainstem tumors: a systematic review and meta-analysis of 735 cases. J Neurosurg Pediatr. 2017 Sep. 20 (3):261-268. [Medline]. Akay KM, Izci Y, Baysefer A, et al. Surgical outcomes of cerebellar tumors in children. Pediatr Neurosurg. 2004 Sep-Oct. 40(5):220-5. [Medline]. Rogers L, Pueschel J, Spetzler R, et al. Is gross-total resection sufficient treatment for posterior fossa ependymomas?. J Neurosurg. 2005 Apr. 102(4):629-36. [Medline]. Sunderland GJ, Jenkinson MD, Zakaria R. Surgical management of posterior fossa metastases. J Neurooncol. 2016 Dec. 130 (3):535-542. [Medline]. Arriada N, Sotelo J. Continuous-flow shunt for treatment of hydrocephalus due to lesions of the posterior fossa. J Neurosurg. 2004 Nov. 101(5):762-6. [Medline]. Jones B. Posterior fossa treatment. Br J Radiol. 2005 Mar. 78(927):285; author reply 285. [Medline]. Raffel C. Medulloblastoma: molecular genetics and animal models. Neoplasia. 2004 Jul-Aug. 6(4):310-22. [Medline]. Wind JJ, Bakhtian KD, Sweet JA, Mehta GU, Thawani JP, Asthagiri AR, et al. Long-term outcome after resection of brainstem hemangioblastomas in von Hippel-Lindau disease. J Neurosurg. 2011 May. 114(5):1312-8. [Medline]. Gjerris F, Klinken L. Long-term prognosis in children with benign cerebellar astrocytoma. J Neurosurg. 1978 Aug. 49(2):179-84. [Medline]. Gupta PK, Saini J, Sahoo P, Patir R, Ahlawat S, Beniwal M, et al. Role of Dynamic Contrast-Enhanced Perfusion Magnetic Resonance Imaging in Grading of Pediatric Brain Tumors on 3T. Pediatr Neurosurg. 2017. 52 (5):298-305. [Medline]. Schumacher M, Schulte-Mönting J, Stoeter P, Warmuth-Metz M, Solymosi L. Magnetic resonance imaging compared with biopsy in the diagnosis of brainstem diseases of childhood: a multicenter review. J Neurosurg. 2007 Feb. 106(2 Suppl):111-9. [Medline]. Smith RR, Zimmerman RA, Packer RJ, et al. Pediatric brainstem glioma. Post-radiation clinical and MR follow-up. Neuroradiology. 1990. 32(4):265-71. [Medline]. Sabin ND, Merchant TE, Li X, Li Y, Klimo P Jr, Boop FA, et al. Quantitative imaging analysis of posterior fossa ependymoma location in children. Childs Nerv Syst. 2016 Aug. 32 (8):1441-7. [Medline]. Othman R, Abdullah KG. Serial MRI Scan of Posterior Fossa Tumours Predict Patients at Risk of Developing Neurocognitive Impairment. Asian Pac J Cancer Prev. 2017 Jul 27. 18 (7):1729-1735. [Medline]. Yamauchi M, Okada T, Okada T, Yamamoto A, Fushimi Y, Arakawa Y, et al. Differential diagnosis of posterior fossa brain tumors: Multiple discriminant analysis of Tl-SPECT and FDG-PET. Medicine (Baltimore). 2017 Aug. 96 (33):e7767. [Medline]. Rath GP, Bithal PK, Chaturvedi A, Dash HH. Complications related to positioning in posterior fossa craniectomy. J Clin Neurosci. 2007 Jun. 14(6):520-5. [Medline]. Jiang C, Wu X, Lin Z, Wang C, Kang D. External drainage with an Ommaya reservoir for perioperative hydrocephalus in children with posterior fossa tumors. Childs Nerv Syst. 2013 Mar 17. [Medline]. Abe M, Tokumaru S, Tabuchi K, Kida Y, Takagi M, Imamura J. Stereotactic radiation therapy with chemotherapy in the management of recurrent medulloblastomas. Pediatr Neurosurg. 2006. 42(2):81-8. [Medline]. Levin VA, Edwards MS, Gutin PH, et al. Phase II evaluation of dibromodulcitol in the treatment of recurrent medulloblastoma, ependymoma, and malignant astrocytoma. J Neurosurg. 1984 Dec. 61(6):1063-8. [Medline]. Morawski KF, Niemczyk K, Bohorquez J, Marchel A, Delgado RE, Ozdamar O. Intraoperative monitoring of hearing during cerebellopontine angle tumor surgery using transtympanic electrocochleography. Otol Neurotol. 2007 Jun. 28(4):541-5. [Medline]. Peeler CE, Edmond JC, Hollander J, Alexander JK, Zurakowski D, Ullrich NJ, et al. Visual and ocular motor outcomes in children with posterior fossa tumors. J AAPOS. 2017 Aug 31. [Medline]. Wells EM, Khademian ZP, Walsh KS, Vezina G, Sposto R, Keating RF, et al. Postoperative cerebellar mutism syndrome following treatment of medulloblastoma: neuroradiographic features and origin. J Neurosurg Pediatr. 2010 Apr. 5(4):329-34. [Medline]. Wibroe M, Cappelen J, Castor C et al. Cerebellar mutism syndrome in children with brain tumours of the posterior fossa. BMC Cancer. 2017 Jun 21. 17 (1):439. [Medline]. Panwalkar P, Clark J, Ramaswamy V et al. Immunohistochemical analysis of H3K27me3 demonstrates global reduction in group-A childhood posterior fossa ependymoma and is a powerful predictor of outcome. Acta Neuropathol. 2017 Jul 21. [Medline]. DeAngelis LM. Chemotherapy for brain tumors--a new beginning. N Engl J Med. 2005 Mar 10. 352(10):1036-8. [Medline]. Gottardo NG, Gajjar A. Current Therapy for Medulloblastoma. Curr Treat Options Neurol. 2006 Jul. 8(4):319-334. [Medline]. Padovani L, Sunyach MP, Perol D, Mercier C, Alapetite C, Haie-Meder C. Common strategy for adult and pediatric medulloblastoma: a multicenter series of 253 adults. Int J Radiat Oncol Biol Phys. 2007 Jun 1. 68(2):433-40. [Medline]. Pierre-Kahn A, Hirsch JF, Roux FX, et al. Intracranial ependymomas in childhood. Survival and functional results of 47 cases. Childs Brain. 1983. 10(3):145-56. [Medline]. Rorke L, Schut L. Introductory survey of pediatric brain tumors. In: McLaurin R, Schut L, Venes J, et al, eds. Pediatric Neurosurgery: Surgery of the developing nervous system. Philadelphia, Pa:. WB Saunders Co. 1989:335-337.